While a shop must meet some strict conditions to join the Cadillac Aluminum Repair Network, the business will get a near-monopoly on CT6 collision business as well as promotion from Cadillac — including CT6 OnStar referrals. GM outlined some of the benefits in a manual unveiled recently. The company wants to create a network of about 100 shops — including Cadillac and other dealerships and independent shops — nationwide vetted for repair of the advanced-materials CT6. Any auto body shop — including Cadillac dealerships — out of the network won’t be able to buy CT6 structural repair parts, and companies such as Chief, Car-O-Liner, Spanesi and Celette will restrict their CT6 measurement data as well. Even if a collision repairer’s competitor says they’ll do structural CT6 repair, they’ll have no way of obtaining parts. 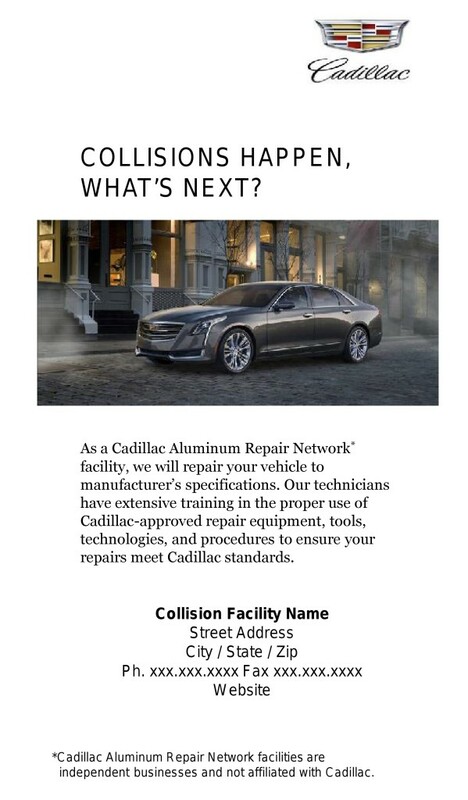 “All Cadillac Aluminum Repair Network facilities use genuine parts that are backed by GM,” a brochure for customers states. It’s unclear if this refers to the restricted structural parts or a ban on any aftermarket parts. Cadillac will also advertise your shop to CT6 owners — including through OnStar, a “virtual steering” scenario predicted by Collision Advice’s Mike Anderson. 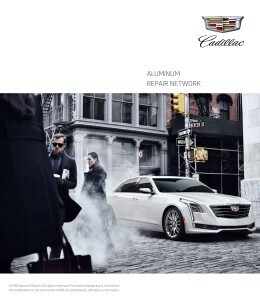 The company promises the flipside to Cadillac Aluminum Repair Network shops in its manual for interested shops. Presumably, somebody who’s paid tens of thousands for a CT6 won’t balk at the cost of subscribing to OnStar or Roadside Assistance, which makes the scenario above even more likely. Even if a CT6 customer didn’t have OnStar or RoadSide assistance, Cadillac dealerships will tout the existence of Certified Repair Network shops, the manual states. “Cadillac customers will have the support of their dealer, OnStar, and insurance companies in locating an Authorized Cadillac Aluminum Repair Network facility,” Cadillac wrote. The manual also states customers will be notified of the network’s existence when their CT6 is delivered and in other materials sent to customers. OEMs this summer described similar promotion of their recommended shops. Out-of-network shops can still do mechanical and nonstructural repairs on CT6s, according to Cadillac. However, they should probably check with GM/Cadillac if there’s any CT6-specific best practices.